Writing your own tools and scripts is always a very satisfying thing. You take something that used to take a long time and then you automate it. 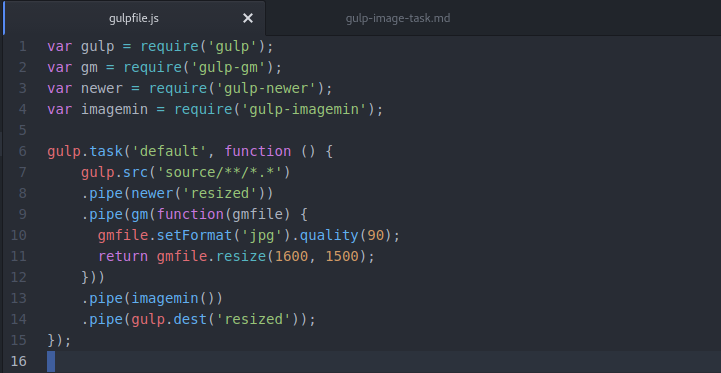 Gulp-newer makes sure that no images is resized again if the source file hasn’t changed (believe me, this is good if you’re resizing a lot of images and you don’t want to wait forever, when changing one). The point of the script is to take a folder / directory of images on the harddrive, convert them to jpg and to resize them. So that’s how we keep the image loading on our blog snappy, even on mobile. From 64 MB to 3.1 MB for 8 images we want to look good is alright I think.